Its already download able! Only for Unreal Tournament 2004. The below link will redirect to download file at filefront. Its also available in download section. enemy mortar and 88s crew to prevent their advantage rain bombardment to land. 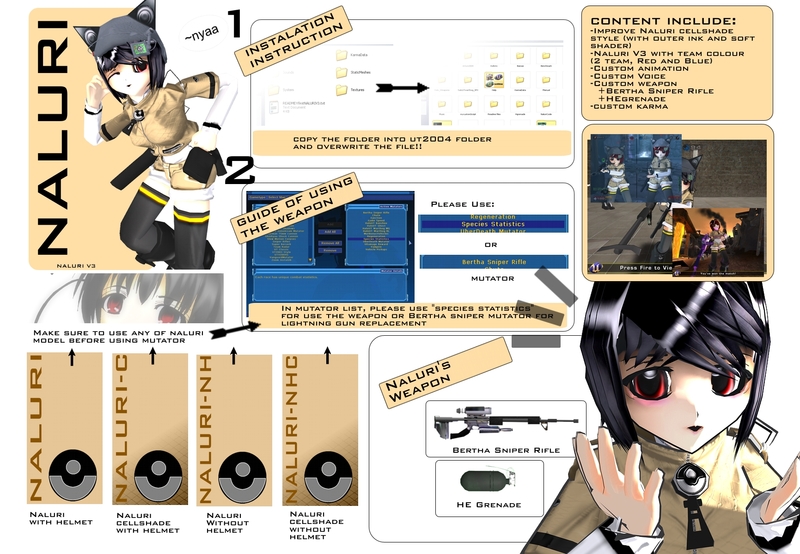 Naluri will be equip with Bertha Sniper and HEgrenade. ovecome this, please double jump. EXTREMES OR ATARI. ELEMENTS TM & © EPIC GAMES INC AND/OR ITS LICENSORS. do u know u can play with her weapon? did u get both bertha and hegrenade? I need some minor help with the bertha sniper, the bertha sniper mutator doesn’t work for me but the species statistics one works, when I use the bertha mutator, it replaces the lightning guns with normal snipers. Any ideas? I use the 75mm, mg42, mg151 mutators with it if those cause any problems. check back if the mutator is not in same categories with others.. I have the Unreal Anthology, and I’ve downloaded about 10 gigs of custom content and a majority of it say it requires patch but it all still works fine, and no other mutators go into the category, I even tried the mut with noothing else on, still no result but the normal sniper. The patch worked, thanks. sorry for the trouble and keep up the good work on the models.